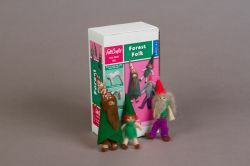 Follow easy instructions to make leprechauns, gnomes and other forest folk for ornaments, pins or play. Kit includes green felt and pinecone felt along with wool fleece to makes three dolls. This is a wonderful activity for children age 8 and up to do on their own, or parents can do with their younger child. This kit is a classic FeltCraft Kit and has been enjoyed by children around the world since 1989.